Click Here To See The 'THE DOCTOR WILL KILL YOU NOW!' Portfolio Plate! Click Here To See The 1981 Amazing Spider-Man Portfolio! The year was 1981 and Everyone was reading SPIDER-MAN..... and loving it. 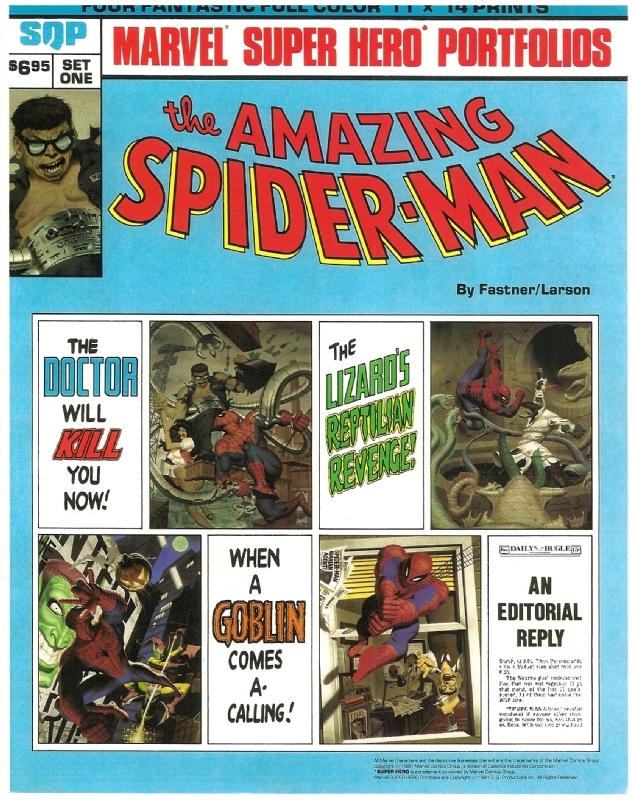 Fanzines and books on Spider-Man sprang-up like weeds and fans ate it up. It was during this time that SQ Productions came up with the idea of doing an AMAZING SPIDER-MAN portfolio featuring 4 stunning painted plates, each suitable for framing. All 4 paintings were created by fan-favorite painters Fastner and Larson. The portfolio set was a HUGE success, and anyone who remembers the "glory days" of that time will easily recognize this AMAZING painting titled: "'THE DOCTOR WILL KILL YOU NOW!" 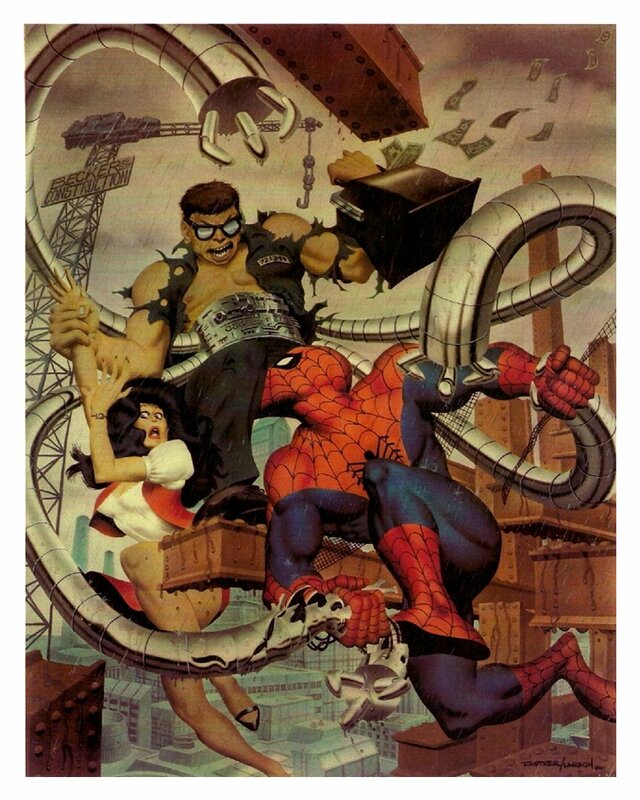 The AMAZING SPIDER-MAN battles Dr. Octopus on the girders of a skyscraper as Doc Ock holds a girl and a bag full of cash, with all 4 metal arms battling Spidey! This is a rare opportunity to own a well-recognized piece of art from the prime period of the Amazing Spider-Man, at only a FRACTION of what you'd pay for an Amazing Spider-Man cover from that time period. 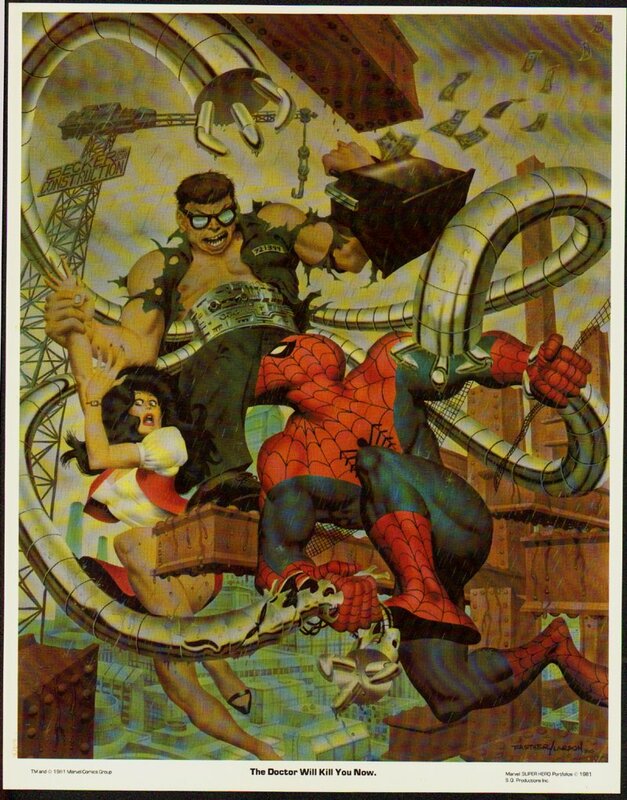 This is a VERY LARGE full-color PAINTING which measures a whopping 20 by 25 inches, (with an actual painted art image measuring 18 by 23 inches) Don't miss this chance to own a great 1981 PUBLISHED Amazing Spider-Man painting! ALL HIGH end pieces of art, including this one, are able to be purchased with VERY fair time payment plan options, and trades are always considered towards this and "ANY" art on our website! Just send us an email to mikeburkey@aol.com and we can try to work something out.